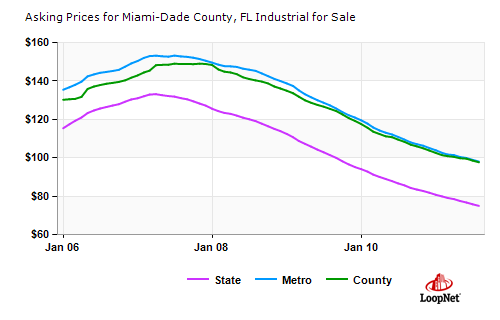 The sales and leasing activity remained steady for Miami’s industrial real estate market in the 3rd quarter of this year. Vacancy rates decreased slightly to 8.4% during this period while the average lease rates increased slightly to $7.15 per square foot. In comparison, the national averages are 9.6% and $5.13 psf respectively. The past and present facts in this report may provide us with some optimism for both the Miami industrial real estate market and the local economy. The only newly-constructed warehouse to mention is GOYA’s completion of their 338,000 sq. ft. warehouse located at 13300 Northwest 25th Street. However, the most significant news is the announcements of four new construction projects of bulk-sized, Class A warehouse buildings by institutional investors, totaling just over 1,000,000 sq. ft. Three of the developments are within walking distance of each other. What is even more amazing is the fact that all of the following warehouses are being constructed entirely on a speculative basis! Warehouse Name Location Size in Sq. Ft.
You might be asking yourself right now if there is enough recent activity to encourage spec development? Our conservative response is “probably yes”. If a company is seeking to lease over 50,000 sq. ft. in these sub-markets there are less than ten choices right now with several prospects now currently in the market looking. Perhaps the most recent, closed deals in these sub-markets are the best indication of the near future. Check out this list of all of the leasing and sales transactions in the past six months of 25,000+ sq. ft. warehouses in Airport West and Medley. Address Tenant Name Size in Sq. Ft.
12855 NW 113 Court 168,201 $28,600,000 $170 Frifa Inc.
Institutional investment companies are looking at the global picture which includes the expansion of the Panama Canal and the recent passing of the Foreign Trade Agreements (FTA’s) with Panama, Colombia and South Korea. Miami is preparing by making major upgrades to its transportation infrastructure including renovation of the Palmetto (SR826) and Dolphin (SR 836) Expressways ( www.826-836.com ) ; deep dredging the Port of Miami channel to 50’; repairing the FEC Railway; new construction of the Miami Tunnel and the Miami Intermodal Center (www.micdot.com); and new terminals at Miami International Airport. According to Miami-Dade County’s Office of Economic Development and International Trade (OEDIT) , “The airport and seaport continue to see consistent double-digit, year-over-year gains in international trade.” All of these transformations are expected to have a major, collective impact on Miami’s warehouse industry. The essence of Miami’s industrial market is truly about exploiting its international trade routes and relationships. To learn of other trends and activity details, please contact ComReal’s Industrial Real Estate Team at 786-433-2380 and/or visit www.MiamiWarehouseTeam.com. We are always available for a friendly, but confidential discussion in regards to evaluating your warehouse space needs and business opportunities. The Third Quarter ended fairly stable with sales prices for class A warehouse condos in the Miami Airport West Dade sub-market at approximately $138 per sq. ft. There were no known sales for this quarter, however ComReal Miami did sell the property at 8565 NW 29 Street in Beacon Centre North for $787,000 or $109 per sq. ft. in June. For those companies leasing class A warehouse condos in Doral, average lease rates should be around $8.25 to $8.50 per sq. ft. quoted as an industrial gross amount. In the last quarter, two known leases were completed within the Airport West Dade, class A condo parks. The leasing of 30,000 sq. ft. in Doral Commerce Park at $7.50 per sq. ft., and 8,700 sq. ft. in the International Corporate Park at $10.95 per sq. ft. Going hand in hand with the lease rates, the vacancy rate at the end of the quarter is 13.1% and is inching its way down. For a more detailed study of Miami Airport West Dade Class A Warehouse Condos, please call Dan Berkovitz at 786-433-2098 or email at dberkovitz@comreal.com.